I found this slide about 10 years ago when I moved into my house. It was found behind a built-in shelving unit in one of the bedroom closets that I removed when painting. I tossed it into a box of pictures since I had no slide projector or scanner to view it with. About a month ago I bought a new scanner that takes slides and negatives and when going through my old photos I re-found this slide. 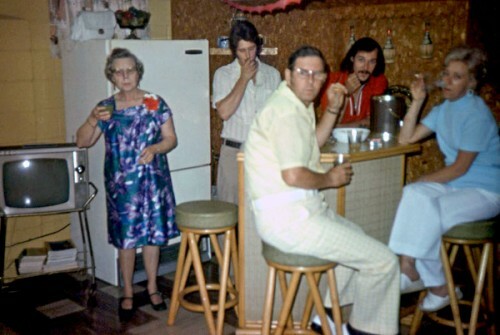 I don’t know who they are or where they were but they seem to being having a good ol’ time smoking and drinking.